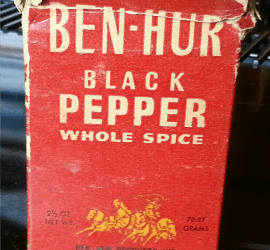 Of all of the many products, places, and institutions to carry the name Ben-Hur, perhaps none was more successful than the Tribe of Ben-Hur. Lew Wallace never belonged to this fraternal benefit organization, but he gave the enterprise his blessing in the early 1890s. He was also close friends with many of the founding members. Headquartered in Crawfordsville for generations, the Ben-Hur Life Association was created by David W. Gerard in 1894. David Gerard had been born on a farm in Shelby County, Ohio, in 1844. David’s family moved to Romney. His father, Abner, died when David was just five years old. His mother and brothers returned to Ohio, where they struggled to make ends meet. By the age of 16, David was teaching school. By the age of 17, he was fighting in the Civil War. After serving for four years, he returned to this area and taught school in Wingate (called Pleasant Hill in his day). He met and married Elizabeth Krug. Together they established their lives here. Wallace and Gerard had already crossed paths at least twice by 1865. When Gerard’s father died, Lew Wallace was a young attorney living in Covington. Wallace was called to help settle Abner Gerard’s meager estate. Their lives crossed paths again during the Civil War. As the economy prospered throughout the 1870s and 1880s, Gerard kept thinking about establishing a fraternal insurance agency. In this agency, the members would take care of their own. In 1893, Gerard and a small group of friends decided Wallace’s Ben-Hur: A Tale of the Christ, would provide not only name recognition, but also a rich background. From this source material, they developed the secret rituals and elaborate hierarchy that fraternal groups in the late 19th century were so fond of. The group met with Wallace, who readily gave his consent and assisted them in getting permission from Harper & Brothers to use the name of Ben-Hur and portions of the book. According to tradition Wallace even suggested the name Tribe of Ben-Hur, as tribes were the organizational structure at the time of Christ. On January 9, 1894, papers were filed with the Secretary of State in Indianapolis. Early leaders in the Tribe included Gerard, Frank L. Snyder, S.E. Voris, Dr. J.F. Davidson, and John C. Snyder. The first session of the Tribe, or grand conclave as it was known locally, was held on January 16, 1894. More organizational meetings followed and on Thursday, March 1, 1894, the community celebrated Ben-Hur gala day. The town was filled to capacity with people from far and wide. By the end of the gala, 422 individuals had become charter members of the Simonides Court Number 1. The Tribe was unusual in its day, as it allowed both men and women to join. Within a few years, the tribe made provisions for children to be included in the benefits program. Gerard was widely recognized as an organizational genius. Within two years there were more than 5,000 members in the Tribe of Ben-Hur and “Courts” had been established in a dozen states from California to New York. The tribe was initially housed in an upstairs room of a downtown building called the Thomas Block, but the organization soon built their first Supreme building. Then in 1912/13, the Tribe built the ornate, white, terra cotta, five-story building that has become a landmark on the corner of Main and Water Streets. While The Tribe of Ben-Hur continued to be based in Crawfordsville, it grew far beyond the confines of Montgomery County and it prospered. During the Great Depression when other insurance agencies and fraternal organizations were failing, the management of the Tribe was such that it continued to grow, astutely purchasing the resources of failing groups. Many of the founding members stayed with the Tribe until their dying day. This was true of D.W. Gerard, who served as the Supreme Chief until his passing on January 3, 1910. Ultimately, changing times and economies did affect the Tribe of Ben Hur and in the 1980s after 90 years of service, the fundamental nature of the organization was changed as it became known as USA Life Insurance Company of Indiana. In 1988, the rituals, offices, obligations, and fraternal nature of this group inspired by Lew Wallace’s book quietly (and sadly for some in Crawfordsville) slipped into history. I found mention of this organization in the obituary of my grandmother who died in 1917 at age 38. The article stated that she had been a member in Mount Carmel Illinois. I found your website while searching Tribe of Ben Hur, but would like to find more specific information about the chapter she belonged to and what activities she might have participated in and what they actually did. Is it possible to check records for her membership? Her name was Katie (Katherine) Finnell. You might check with the Carnegie Museum of Montgomery County. They have some of the Tribe of Ben-Hur records there. Their phone number is 765-362-4618.